Jaime Lerner, former mayor of Curitiba, Brazil, has a great saying, “You should treat the automobile like your mother-in-law. You must have a good relationship with her, but don’t allow her to dominate your life”. 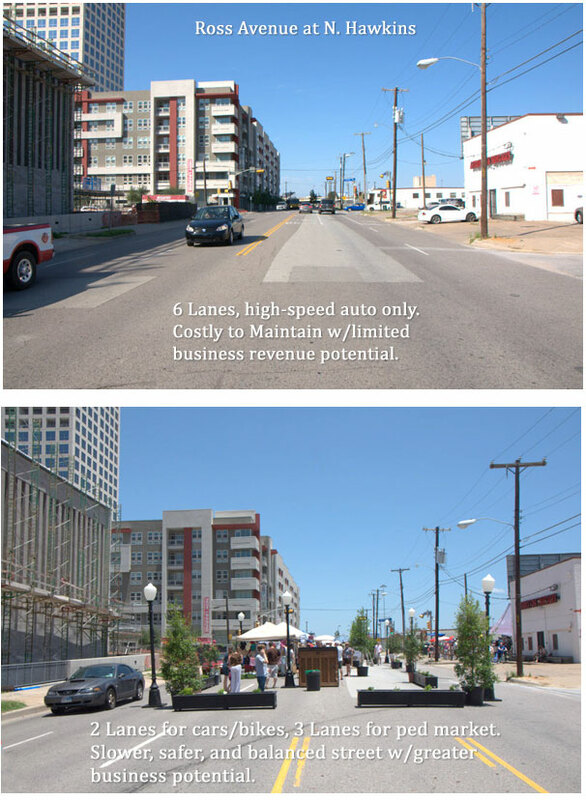 Our Ross Better Boulevard project re-balanced the equation of the street giving equal weight to people and cars. This simple measure dramatically changed the psychology of the street and showed the potential for how our city can move forward in creating great places. Financially speaking, we know that making our roads auto-only doesn’t pencil out. To make matters worse, the larger the road, the greater the expense in maintenance. For Ross Avenue, we took a 6 lane road and developed a pedestrianized center that allowed entrepreneurs an opportunity to test their business while creating greater economics to the area. Normally, we’d generate no money from this street and actually spend millions to fill in potholes and repave. The wider the street, the more costly the maintenance, which directly affects our property taxes…repaving one mile of a 6 lane road in Dallas costs millions and we have hundreds of miles of these throughout the city. An assumption often made is that our roads are paid for by gas taxes. The reality is that none of our residential and non-highway/interstate roads are covered at all by gas taxes…it’s soley property taxes. To make matters worse, when business opportunity erodes in an area, we typically raise taxes to continue maintenance which pushes business away and creates an undue burden on residents to fill in the void. The money we’d save by reclaiming portions of the streets for businesses and people would go far to helping our city’s balance sheet. Fewer potholes to fill while increased area business tax revenue would help cover the costs of pedestrian amenities like lighting, watering trees, et cetera. 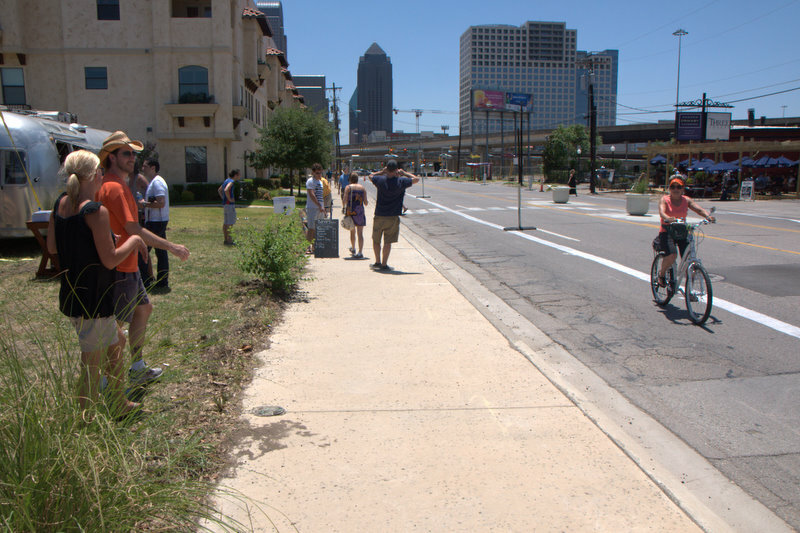 As drivers in Dallas, we all face a challenging dilemma with shifting our ideas that our streets are for our cars only. I know that whenever I’m behind the wheel, I’m frustrated by anything that makes me go slower getting from point A to B. The reality is, traffic flow is slow in great places. Whether it be Greenville Avenue, Bishop Arts District, McKinney Avenue, the West End Marketplace, et al, we have multiple illustrations of areas where we’ve created greater mobility options for all users (peds, bikes, public transit, cars), where things are slowed down, and an increase in economics, safety, and functionality occurs. No one should be able to drive fast through any major downtown…that’s what our highways are for. Beyond that, it’s hard to find parking in great places. Right now, we have the opposite in our city: higher speed traffic flow, and seas of parking. We have to acknowledge and allow car access to areas, but it should not be the dominating component in our urban planning efforts. A simple equation we should follow for creating great streets is asking ourselves, “Does it feel safe for a family or senior to walk near or bicycle on?” Balancing the modes for all users will be key to creating safer, more prosperous, economically viable, and active streets. I think a key point is recognized here: the goal isn’t to banish the car from development. But rather not to allow it to dominate our spaces. This is great! I’m sad I missed the event. If more things like this happen in the DFW area, I’d love to help out!